It’s not just a straw, it’s a movement. You may not have heard of California Assembly Bill 1884 by name but chances are you’ve heard of the plastic straw ban that’s taking the country by storm. According to the bill, when you dine at a full-service restaurant in California, you are getting your beverage without a straw – unless you ask for one, or it is a to-go drink. While California may be leading the charge on the ban, plenty of restaurants in other states have followed suit. And while restaurants in violation will be fined $25, it’s perfectly legal to hand out reusable straws. Better yet, you can even brand them with your logo. Reusable straws are designed to last for many years, are easy to clean with a straw brush, are generally dishwasher safe, and they are made from high-quality, plastic-free recyclable materials. Also, they can be used with hot and cold beverages, which is perfect if you prefer to sip your hot coffee or tea in the morning and want an iced beverage for the afternoon. So, if not plastic, then what are they made from? Environmentally-friendly straws are generally made from metal or silicone, and often come with their own carrying case or pouch – this stainless steel straw also includes a cleaning brush! Since straws themselves don’t have very large imprint areas for your logo, the branding is done on the pouch or the case. This reusable silicone straw comes rolled up in a convenient travel case. If the idea of having to clean a straw after every use is not appealing, you can give out paper straws. Restaurants and bars nationwide have started to implement this change with great results – paper straws are biodegradable (and marine degradable), and this doesn’t require a change in behavior, just a change in materials. 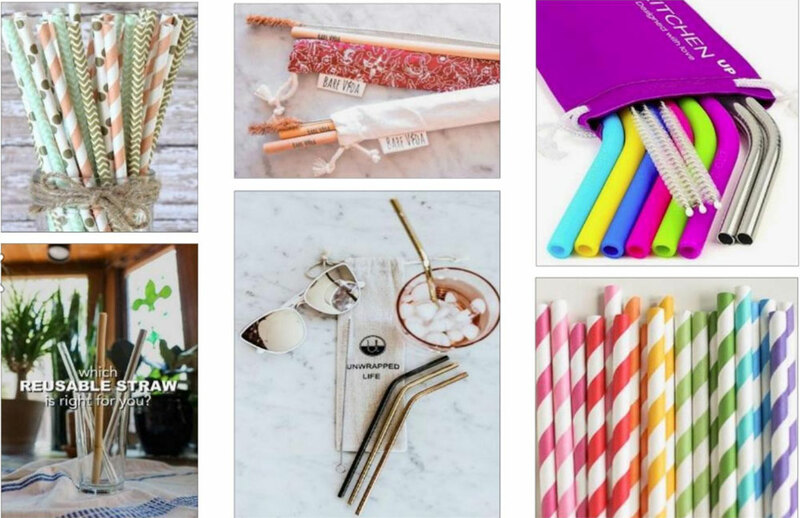 This five-pack of paper straws comes in its own brandable pouch – a simple and effective eco-friendly giveaway. Similar to disposable plastic bags, straws are only used for a few minutes but remain in the environment forever. They end up on our beaches and in the oceans – up to 80% of our trash is plastic of some form or another. So while straws may not be the one contributing problem, many companies including Starbucks, Hyatt and Hilton have pledged to do their part in cutting back. Over 500,000,000 plastic straws are used in the U.S. every day, enough to wrap around the Earth 2.5 times. Now is the time to switch from the one-time-use plastic straw to the reusable straw. Fortunately, the switch is easy. Promotional reusable straws: Saving the planet + a brand opportunity = a win-win.